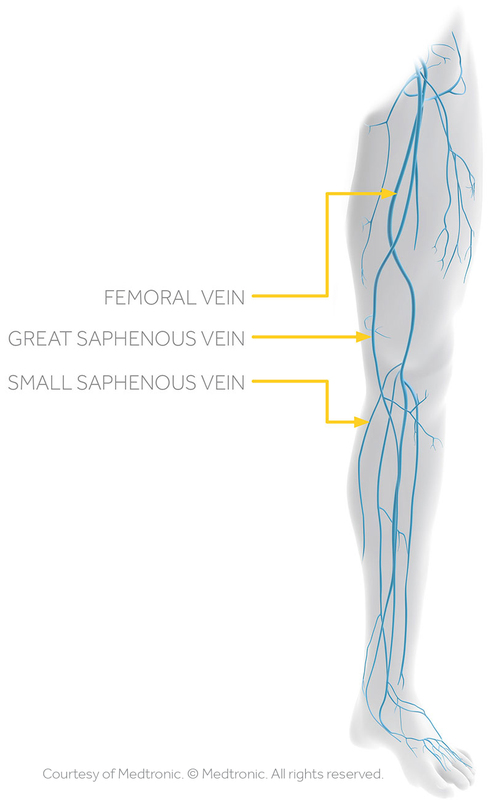 The underlying problem with most superficial venous disease is reflux or venous insufficiency. Valves in the veins of the legs are responsible for ensuring one-way flow of blood back to the heart. When these valves fail, due to many risk factors, venous reflux occurs. Refluxing valves allow blood to fall back down the leg. Varicose veins start to pool with blood eventually leading to leg swelling and other signs and symptoms. Helping patients feel better often begins with identifying the problematic vein or veins. To identify the unhealthy valves, an ultrasound machine is used to examine the legs. The ultrasound machine can visualize blood flow using sound waves that travel through the legs and send back signals to the machine. This is a very safe study and does not involve radiation or injecting medicine into the body. Our sonographer will have you move into particular positions that help us visualize the blood flow. After the examination, we will discuss the results with you and help you visualize your venous anatomy. We are advocates of the patient education want you to leave our consultation with a thorough knowledge of your venous health. If our ultrasoun d demonstrates venous disease worthy of treatment, we will go over treatment options with you in detail. We will give you all the tools you need to make a well-informed decision. Come to learn and feel better at the same time.